Argghh! It's so hot these days! I could even sweat when reading newspaper in the living room, right under the ceiling fan with full speed. 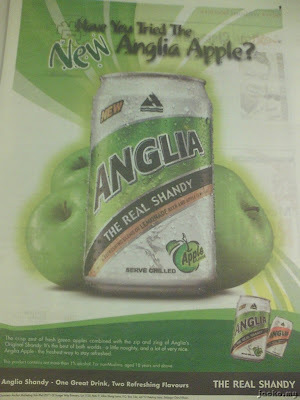 Even for the taste, not much difference from the original Anglia Shandy. I could taste a bit of apple for the first time, and perhaps my tongue was numbed to it after a while which it tasted like original Anglia Shandy to me. I was expecting the taste like ordinary apple juice mixed with beer. But this is not a disappointment at all, it served its purpose, to chill :) though I prefer the original shandy.